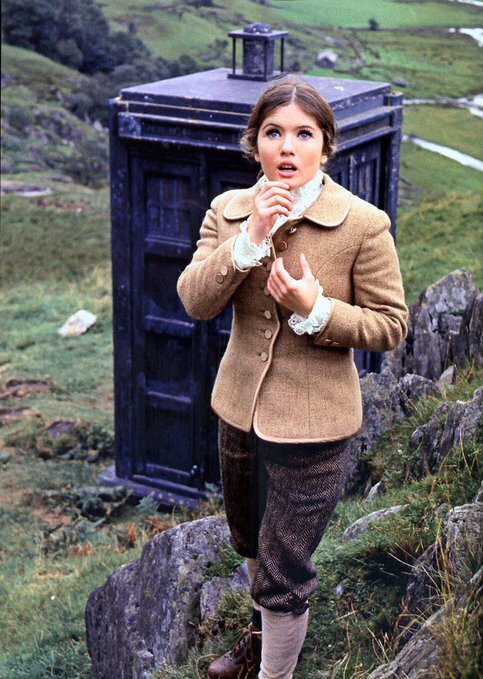 I was very sorry to hear today that Deborah Watling has died at far too young an age. Whilst she’ll no doubt always be best remebered for Doctor Who, she had several other entries on her CV which are worth checking out. Right at the beginning of her career was H.G. Wells’ Invisible Man (1958). Ten-year old Debbie played Sally, niece to Peter Brady, the invisible man of the title. Sally rarely played a central role in the stories but Debbie was always eye-catching and managed to steal more than a few scenes. Her last dramatic television role was as the vampish Norma in Danger UXB (1979). Possibly not a series that’s terribly well-remebered today, but it’s a quality WW2 programme with a fine ensemble cast which I’ll have to dig out soon for a rewatch. On the big screen, 1973 saw her act with two British pop stars from very different generations. Take Me High, a tale of Cliff Richard and brumburgers is a wonky guilty pleasure whilst That’ll Be The Day is in a different class altogether. Debbie played Sandra, a young girl used and rather abused by the feckless Jim MacLaine (David Essex). That’ll Be The Day is more than a David Essex star vehicle since it stands up as a decent film in its own right. It’s something else which I’ll no doubt be revisiting shortly. Back In my convention-going days I had the opportunity to meet Debbie on several occassions and she was always a delight – an attentive and welcoming guest. Possibly my strongest memory of her comes from a small convention held in Weston-Super-Mare during the mid nineties. As often happened, the timetable started to go a little awry which meant that nobody was terribly pleased when the auditorium was cleared for what appeared to be no good reason. But all turned out well in the end as it became clear that Debbie had been rehearsing a special entertainment – a song and dance routine where, showing a good deal of leg, she left most of us speechless! Happy days and a memory to treasure. This is an obvious clip to end on, but it’s a very pertinent one. Thank you Debbie. RIP. The works of Alan Simpson and his writing partner Ray Galton have been an ever-present part of my life since the early eighties. It would have been about 1980 when, rooting around in my parents record collection for something of interest, I found two LPs – Steptoe & Son on the Pye label (The Bird on side one, a selection of series one highlights on side two) and the Golden Guinea LP of Tony Hancock’s The Blood Donor/The Radio Ham. They may have already been twenty years old, but they didn’t feel like crackly relics from another age – instead they seemed quite fresh, even if some of the references were rather obscure (it took me years to work out what the Blue Streak was!) For me that’s one of the many reasons why I love their work – it may be rooted in a specific time but it’s also strangely timeless. The blog’s been on a bit of a G&S trip recently, with the Paul Merton series, and once that’s done I’ll be moving onto a series of posts about series one of the television incarnation of Hancock’s Half Hour. Although only the scripts are left, the quality of the writing is so good that even without Tony, Sid and the others you can still get an excellent impression about how they would have played out. Which is a true testament to the skill of Alan and Ray. Although Alan Simpson’s health had failed a little in recent years, he was still able to witness how the scripts he wrote with Ray Galton all those years ago continued to connect with fresh audiences. When they attended one of the R4 re-recordings of HHH a few years back they received a very warm reception (and a standing ovation) but Alan seemed more touched that the audience still responded enthusiastically to the script, just as they had sixty years ago. Which returns me to my earlier point. Classic comedy is timeless and will endure long after more transient fare is forgotten. Nobody can tell what will be remembered in fifty years time, comedy-wise, but if anything deserves to be, then it’s the work of Alan Simpson and Ray Galton. The news of Gordon Murray’s death closes another door on the golden age of British children’s television. Camberwick Green (1966), Trumpton (1967) and Chigley (1969) were repeated for decades by the BBC and were then later picked up by Channel 4 and Nickelodeon Junior. All three series were remastered a few years ago and are therefore available on DVD to enchant yet another generation. And I see no reason why the magic of the Trumptonshire trilogy shouldn’t endure for years to come – as all three series have a timeless feel. Murray didn’t make the shows on his own – Bob Bura, John Hardwick and Pasquale Ferrari were responsible for the animation, Freddie Phillips wrote the music, Alison Prince provided the scripts for Trumpton, Andrew and Margaret Brownfoot constructed the sets, whilst the unmistakable tones of Brian Cant enchanted a generation. Why has Murray’s world endured? In a 1996 interview for the radio series Trumpton Riots (this title was a sly nod to Half Man Half Biscuit’s legendary song) Murray felt it was due to the air of innocence that pervaded all three series. “There’s no crime you know in Trumptonshire, it’s a happy world, and a lot of people say ‘well you shouldn’t encourage children to think that the world’s like that’. Some people throw their children into the deep end of the swimming bath at an early age and say ‘swim’. You know, that’s the way to learn, life’s hard. Hard things are coming to you. I don’t believe in that. I believe that you must protect your children while they are children for as long as possible from this dreadful world we’re living in.” You can listen to the episode here. Another reason why they have such appeal is the sense of repetition. For a pre-school programme this is quite important, as the audience will no doubt enjoy the comfort and stability of the same things happening again and again. If most people were asked their memories of the shows, they might mention the music box, or Pippin Fort, or the Trumpton Clock, or Pugh, Pugh, Barney McGrew, Cuthbert, Dibble and Grubb, or Lord Belborough’s train, etc etc. These things remain in the memory longer than the individual plots. All the series had memorable opening and closing sequences. Camberwick Green had the music box (“Here is a box, a musical box, wound up and ready to play. But this box can hide a secret inside. Can you guess what is in it today?”). Trumpton opened with the town clock (“Here is the clock, the Trumpton clock. Telling the time steadily, sensibly, never too quickly, never too slowly. Telling the time for Trumpton”) whilst they ended with the fire brigade entertaining the locals at the bandstand. True, the opening of Chigley was less iconic than the previous two series, but the closing sequence of the dancing workers from the biscuit factory made up for it. Thank you Gordon, from millions of children of all ages. RIP. The news of Victoria Wood’s death at the age of just sixty two has come as yet another unpleasant shock in a year that has already seen the departure of far too many talented people. Set in a seedy Northern club, it follows the misadventures of Julie, keen to hit the heights of showbiz, and her socially awkward friend Maureen. In 1979 it was recorded for television with Wood as Maureen and Julie Walters as Julie. This was a key moment, as Walters became the first of Wood’s “rep” company of actors (later to include the likes of Duncan Preston and Celia Imrie). With a host of strong supporting performances from the likes of Bill Waddington, Nat Jackley and Kevin Lloyd, Talent was a more than impressive debut. Wood and Walters would also feature in another Wood-penned play, Nearly a Happy Ending (also 1979) and off the back of these plays it probably seemed logical to give them their own sketch series, Wood & Walters (1981/82). Although something of a curate’s egg, it’s also fascinating viewing due to its obvious similarities to the later BBC show Victoria Wood: As Seen On TV (1985 -1987). Possibly part of the slightly off-key feeling about Wood & Walters is because neither of them were household names at the time – so the audience tended to be appreciative, rather than effusive (in some ways it’s similar to the polite and muted reaction to the early Monty Python shows). By the time of As Seen on TV, Wood was a much more recognisable figure and whilst the material was stronger, her increasing bond with the audience no doubt also helped to generate a more positive response. Following the end of As Seen on TV, Wood obviously felt that she didn’t want to write any further sketch series (although she’d produce a number of Christmas Specials over the next few decades). Her next major work was Victoria Wood (1989). A series of six unconnected half-hour sitcoms, it was politely received but never garnered the same critical reputation that As Seen on TV did. Which is a pity, as it’s full of Wood’s trademark wit and remains one of the undiscovered gems of her television career. During the time that she was writing and performing on television, she was also pursing a career as one of the nation’s top live stand-up comedians – which may explain why her credits for a large part of the 1990’s are fairly sparse. But there was Pat and Margaret in 1994 (a Screen One play with another memorable role for Julie Walters) and between 1998 and 2000 she would write the show which will probably remain her signature series – dinnerladies. Gathering some of her trusted collaborators around her (as well as some fresh blood) dinnerladies was a fine ensemble piece. Wood was always a very unselfish writer – which can clearly be seen across the course of the series’ sixteen episodes. If dinnerladies is essentially about the journey of Bren and Tony, every other main character is still allowed their chance to shine and often Wood gave the biggest laugh lines to other members of the cast, rather than hogging all the best jokes for herself. Still a regular on Gold, there seems no doubt that dinnerladies will be one of those handful of sitcoms (like Dad’s Army, so beloved by Wood herself) which will endure for decades to come. Tonight, I plan to dig out Talent for a rewatch, which I think is a suitable tribute to a great British comedy writer and actor. RIP. 2016 continues to be a bitter year, with the sad news that another favourite actor of mine, Gareth Thomas, has died. Whilst there’s no doubt that he’ll always be best remembered as Roj Blake, he made a score of other television appearances – a few of which I’d which to highlight. Parkin’s Patch (1969-1970) was his first regular television role – he played Ron Radley, one of the supporting characters to PC Moss Parkin (John Flanagan). It’s a decent village-based police series and the DVD is worth picking up. Another series with Gareth Thomas in a supporting role which is certainly worth a look is Sutherland’s Law, which saw Thomas play alongside Iain Cuthbertson (later the pair would appear in Children of the Stones, yet another series that any fan of 1970’s archive television should own). Thomas was part of a fine ensemble cast who were brought together for the 1975 BBC adaptation of How Green Was My Valley. Stanley Baker, Sian Phillips, Nerys Hughes, Ray Smith, Jeremy Clyde and Clifford Rose were amongst his co-stars, which gives a good indication of the strength in depth of the casting. Not everything he appeared in was of the same quality, Star Maidens (1976) was entertainly awful but Thomas managed to emerge with his dignity intact. Not an easy job! He was a semi-regular in the likes of By The Sword Divided and London’s Burning in the 1980’s and 1990’s and continued to rack up numerous credits up until Holby City in 2011. Although a fair amount of his work is available on DVD, a few key series aren’t. Knights of God (1987) is, like the rest of the TVS archive, mired in rights issues so YouTube is the best bet for that one. It would be nice to see someone pick up Morgan’s Boy (1984) for a DVD release though. Returning to Blakes 7, whilst Blake might sometimes be overshadowed by Avon (it’s always easier to write for the dissenting voice on the sidelines, rather than the straight-ahead hero) there’s no doubt that Thomas was the glue that held the series together for the first two years – Blake’s absence was certainly felt during series three and four. And Blake’s return in the 52nd and final episode still has considerable power and impact some thirty five years later. Time marches on alas, and it’s more sad news that another favourite of this blog – Douglas Wilmer – has passed away. Blessed with a long life and a lengthy career, he was also fortunate that he seemed to keep his sharpness pretty much to the end – he was a pithy contributor to the BFI DVD release of his Sherlock Holmes series last year. I’ve written in depth about Wilmer’s Sherlock Holmes elsewhere on the blog, but suffice it to say that if you love Holmes, or you love archive television, then the BFI set is something you really should have in your collection. And even if you have no interest in Holmes, there’s plenty of other fine Wilmer performances to seek out. RIP Douglas Wilmer. 2016 has been a wretched year so far for losing people from the era of television that I love and the death of Richard Bradford (1934-2016) is yet another sad passing. Probably best known for Man in a Suitcase, Bradford’s American method acting might not always have won him friends amongst some of his fellow crewmembers, but it certainly helped to elevate what would otherwise have been a rather standard ITC adventure series. But thanks to Bradford’s insistence of throwing punches for real and looking like he was actually suffering, the series stood apart from its contemporaries. So time to dig out the DVD to spin an episode in tribute. RIP.